Summer heat can not only be intense in Cathedral City, it can also be dangerous. Not having air conditioning is not an option. For all your installation, maintenance, and upgrade needs call Desert Air Conditioning Inc in Cathedral City today. We will make sure you are comfortable and safe all year round. With 57 years of experience behind us, our three-generation, family owned and operated company knows what we are doing. All our professionals are factory trained and familiar with the unique needs of the Coachella Valley region. We want to keep your air conditioning working at its optimal capacity. That is why our service plans are affordable. Not having to deal with a breakdown is priority number one! All of our installations are done with leading brand names from quality manufacturers you can trust. Our brands have extended warranty coverage when you register your product name. At Desert Air Conditioning we want you to feel protected and backed by the best warranties available. Whether you have an air conditioning unit we have installed or not, we can maintain it. We offer maintenance for just about any brand you might have. Prevention is the key to staving off an air conditioning breakdown. However, if you do have an emergency, our fleet of trucks are fully stocked and ready for your call. In the heat of Cathedral City, you should not have to wait if your air conditioning stops working. Desert Air Conditioning offers upgrades to your new or existing air conditioning. Do you or your family suffer from respiratory problems? We can install high-efficiency air cleaner that will reduce the difficulties exacerbated by this high-dust region. Bacteria and fungi can live in the dust that finds its way into every crevice of valley homes and businesses. These air cleaners filter out contaminates while being light on your wallet. In addition to dust-borne pathogens, these cleaners also reduce pet hair and dander. By decreasing pet dander that gets kicked up into the air these air cleaners help reduce allergenic reactions to pet dander. Another upgrade Desert Air Conditioning can install are programmable thermostats. Further your savings by keeping your home or office at a warmer temperature when no one is there. You can program the air to come down to a lower, more comfortable temp just before everyone arrives—keeping expenses low and people content. These thermostats have a zoning options as well. Bedrooms or conference rooms can be set to a cooler level when they are in use, while the non-used areas are set to at a higher degree. Or, make everyone happy and allow each room to be set at individual preferences. Doesn’t it feel great when there is no fighting over the thermostat setting? 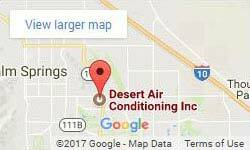 At Desert Air Conditioning our A/C and heating contractors want everyone in the Cathedral City area to be comfortable, safe, and happy. Did you know that Cathedral City started as a housing subdivision in the mid-1850s? It was incorporated in 1981. And, did you know that some of the most famous residents of the city are at rest in Forest Lawn Cemetery and Desert Memorial Park? People come from all around to pay their respects to Rock Hudson, Dinah Shore, and Frank Sinatra, just to name a few. Cathedral City also boasts of a beautiful Town Square. With an award-wining, interactive fountain and events such as the Fountainworks Festival, an annual tree lighting, and the Youth Festival, this meeting place has much to offer.